WOW! The first day of Spring and it is absolutely gorgeous out. Things sure can change in a week's time. There is a lot of flood damage here in eastern Nebraska. So far the news has reported that there are 70+ counties with disaster status(we only have 93 counties in all of NE). Western NE got hit with a blizzard and we had several inches of rain that melted a large amount of the snow that we had piled up everywhere. That plus a dam breaking up at Spencer NE and several levees being breached along the way downstream and ice jams along the Platte and Loup Rivers there is a HUGE mess for miles and miles. Several major roads are still closed by West Point, Valley, Scribner, Waterloo, Ashland and into Omaha. I29 from Council Bluffs, IA to St. Joseph, MO is closed. Levees broke or were breached by Hamburg, IA and I believe Missouri Valley, IA also. Vice President Pence flew into Omaha and assessed the damage in NE and IA. Governor Ricketts has said that this is probably the worst flooding NE and parts of IA have ever seen. So far I think there have been 3 lives lost here in NE due to the flooding. The loss in livestock and pets has not been tallied up yet, but I'm sure it will be extensive. On a happier note we have gotten our seed potatoes and onion sets and plants in today. The varieties of seed potatoes we have available are Dakota Pearl, Kennebec, Norland, Red Pontiac and Yukon Gold. They will be .49 a pound or $20.00 a 50# sack. I have red onion sets that will be .40 a 1/4# bag, .80 a 1/2# bag and $1.49 a 1# bag. Our onion plant varieties are Candy, Ringmaster(White Spanish) and Walla Walla. They come in a bunch of 50 to 75 plants and will sell for $3.49 a bunch. Also our Northrup King seed rack is in so if you want to get some seedlings going come on in and get started on your garden today! In a month Easter will be here! If you need flowers for family, friends or church stop by and see what we have available. Easter lilies will run $12.95 each, but we do have special prices for church orders. We will also have azaleas, reiger begonias, hydrangeas, mums, asiatic lilies, gerbera daisies and some african violets. THINK SUNSHINE AND WARMER TEMPS! 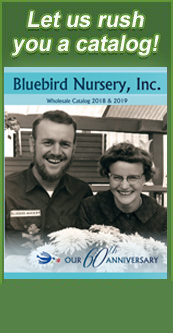 Deb Karel and the staff of Gardenland - the retail division of Bluebird Nursery, Inc.